Thank you for being my Valentine each and every day. I remember being young and always looking forward to Valentine's Day. I don't know what it is about it, because really it's just any other day. But there's something special about it because it always gives me butterflies. Or maybe it's the person I get to spend Valentine's Day with who gives me butterflies. Yeah, that must be it. To the man who allows me to be myself, thank you for putting up with my crazy. On this special day, I need you to prepare yourself, but I know you already know. Instead of taking an hour to get ready, I'll probably take two. So just be ready. Also, we can't forget the camera for obvious reasons. Thinking back to Valentine's Day in elementary school, I was the girl who dressed in pink, with a heart sticker on my cheek and a handful of Valentine's in hand. Side note, but whoever stopped that tradition in middle school probably had a bad breakup at some point. Anyways, back to my Valentine: I met you in middle school and both know what happened. I was a bully, and I took your chair one day but thank goodness you didn't mind too much, because who knew just a few years later, I'd be drawing hearts next to your name in my notebook, rather than taking Biology notes. I never thought I'd have a high school sweetheart, let alone a Valentine at all in high school. Everyone knows high school is the worst when it comes to love. Or maybe that's college, who knows. All I know is I am one lucky girl. I am lucky because I get to spend Valentine's Day and every other day with my best friend. I don't care if we go out to the fanciest restaurant there is or spend the evening watching movies and eating chocolate. If I'm with my Valentine, I'm happy. When you've been with someone long enough, you kinda just know. Things flow, and there's little pressure. I don't have to say anything. You know me to my core and I couldn't feel more secure. You are my best friend, my boyfriend, my Valentine, and my rock. After five years, I still love celebrating Valentine's Day with you. You let me be me. To this day, I will wake up on Valentine's Day feeling especially lovey and girly, wanting to spread love and appreciation. Some people may hate Valentine's Day, but I will forever feel butterflies when thinking of my first Valentine. To the man, I never expected to meet, let alone fall for. Thank you for being you and for letting me be me. Thank you for loving me each and every day. You are my Valentine today and for as long as I can see. It's safe to say, I think you're stuck with my crazy. Here is to the past two years and the many to come! Our story! This is a little tribute to Sam and I's story, how we met, and some of the most amazing things that have happened over the past two years! Two years ago today at the time of 10:25 am made April 25, 2017, the day that I would cherish and remember forever. My boyfriend and my best friend, Sam asked me to be his girlfriend after Spanish class, which was the class we had together. Sam was a senior in high school and I was just a junior, we had Spanish class together in the morning, every day. Where it all began, Sam and I had Spanish class together, we had never said a word to each other, I knew his name, saw that he was cute, and loved his laugh. Lost in confusion in that class we continuously looked across the room at each other and laughed and made weird confused faces. We played a study game in class called Kahoot, both of our goals was to win and beat out the other on the leaderboard. He usually won. Then there was social media which played a little roll in how we started talking, in the early weeks of March 2017, I put my Snapchat on my Instagram story because I had a major crush on Sam and wanted to see what would happen. After the 24 hours of it being on my story, nothing happened, so then I went and put it in my Instagram bio and just left it there. Two whole weeks later, I got a notification on my phone saying that Sam had added me on Snapchat. I freaked out (that is a bit of an understatement) and added him back. I was shocked and thought he must have been looking at my Instagram. I waited a few hours and decided on March 16, 2017, that I would send the first Snapchat, it said "Don't forget to wear green (with a green heart)", this seems really random, I know, but there is a reason behind it, the next day was St. Patricks day and our Spanish teacher said that if the entire class wore green we didn't have to take the quiz, we all needed this, so I just wanted to make sure he didn't forget. At this point, all I knew was there was this super cute guy in my class, who I liked a lot. After Snapchatting for a little less than a month, and to be honest not ever talking in person because we were nervous and cheesy, I walked into Spanish class on April 7th, 2017, to Sam dressed in a blue button-up shirt and a pink bow-tie (which he says was for baseball) holding a poster that read "Will you rock with me to prom but before will you rock with me to the Zac Brown Band concert?" Of course, I said YES! 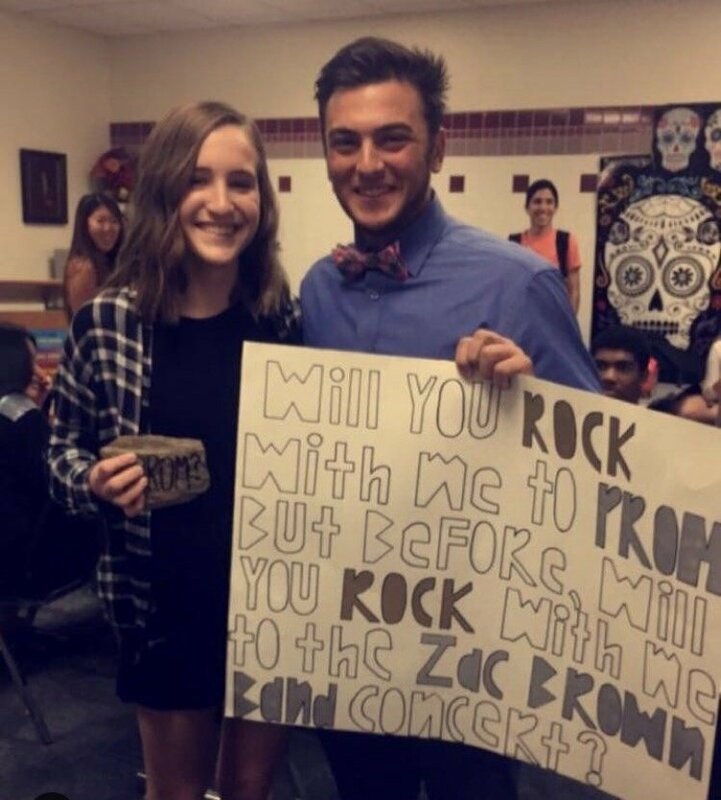 Now not only was I going to prom with this amazing guy that I had never talked to before in person, but he also found the way to my heart, with what is now one of my favorite bands, Zac Brown Band. Still communicating on Snapchat, one night I was Snapchatting him as my sister was driving a friend home, I told him that I was running out of data and couldn't Snapchat right then, he responded saying he was too, which made no sense because he was at home, but at the time I believed it, (we both were not running out of data we just wanted each others number), once we had each others number, the rest of our story kind of all fell into place. A week or so later I invited him to come with my friends and me to go bowling, he agreed, and this was the very first time we hung out and even talked in person. Our first date: I was out at a birthday dinner on April 23, 2017, for my friend and when I got home I got a text from Sam saying "I am coming to pick you up, what is your address, let's go get ice cream?" To say I had butterflies in my stomach or that I was nervous is an understatement, I had never had a conversation with him just him and I, what was I going to say? He got to my house, HE CAME TO THE FRONT DOOR, we got in the car, and drove to Sweet Republic, a local ice cream place not too far away, it was a little quiet because it was quite obvious that we were both nervous. We got to Sweet Republic, Sam got mint chocolate chip, and I got brownie swirl, we ate the ice cream talked, and played games, at Sweet Republic they have games, we played a couple of different ones. This has become our spot, every time we are home together we make it a tradition to go. Oooh the first kiss: Driving home from our first date on April 23, 2017 we arrived back at my house, he walked me up to my front door, I wasn't expecting anything, it was our first official date together, I went to unlock the door and say bye, and he grabbed my hand and pulled me back for our first kiss. It was great. That's all I am going to say. Back in Spanish class on April 25, 2017, we had a normal class, but what happened after, is why I am writing this article, I walked out of Spanish, Sam and I would talk before I went to English which was my next class, right then he asked me to be his girlfriend, I said yes of course. Best. Day. Ever. It was now two days before Prom, May 5th, 2017, we were headed to the Zac Brown Band concert, he picked me up from my house and met my parents for the first time. The concert was so fun, the best concert that I have been to, I may be biased, I mean going with Sam was definitely a plus and made the concert so memorable. May 7, 2017, was our first prom together, Sam showed up to my house dressed in his all black suit with "Champagne" colored tie and vest to match my black and "Champagne" dress, with his parents and his sister, so not only was it prom I was also meeting his family, I was nervous, but looking back on it now, I wouldn't have changed the timing of it all, what so ever. His family was so nice and welcoming, made me feel like part of the family right away. To make this short his family is amazing and I love them. 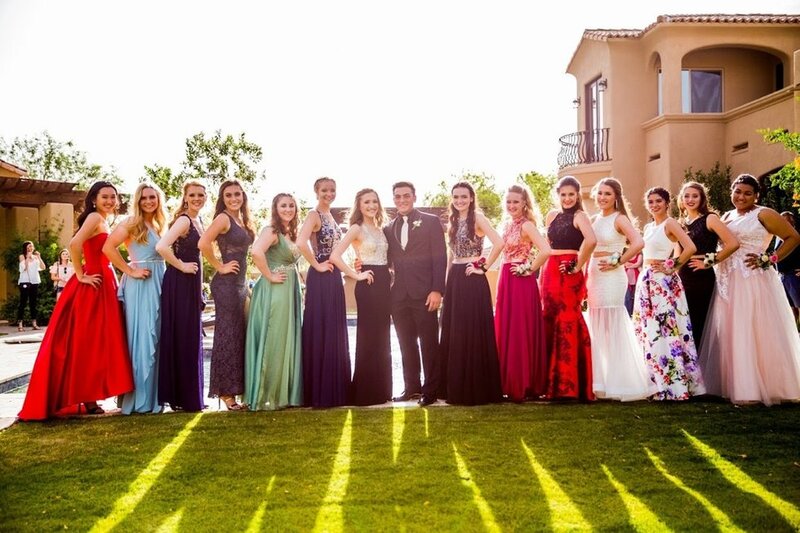 We had the most amazing time at prom, danced the night away at the Phoenix Children's Museum and lived up to the prom 2017 theme, "Forever Young." After less than a month of dating, Sam told me he would be going to college in Ohio, although I knew this was far, I didn't think much of it. The thought of not doing long-distance never crossed my mind, we tried not to think of it throughout the summer, we just made the most of all of the time we had together. I was and still am proud of him, he was going to follow his dream and study business management. The night that we said bye and you left for your freshman year of college, was one of the hardest days of my life, at this point we had only been dating for four months almost five, I don't think I have ever cried so hard in my life, it felt like everything was being ripped away from me, I am not exaggerating when I say I felt like I couldn't breathe, my heart ached. We are a few weeks away from completing our second year of long-distance. We have done what many wouldn't even try to do. From my two trips to Ohio to visit, exciting winter breaks together, Valentine's day when he said he was coming home for my senior prom, lots of country concerts, trips and hikes, and so much more, life with Sam is more than I could have ever imagined possible. Although long-distance isn't always easy, we are killing it! To our families and parents, thank you for believing in us, and helping us through one of the hardest things we have to do right now, thank you for showing us what love is, and continuing to ensure our confidence that we can do this. We love you! To Sam, thank you for being my best friend, my biggest supporter, and my whole world. Thank you for all of the laughs, the thousands of FaceTime calls and for making me feel like the most amazing girl in the world, I am the luckiest girl to have such an amazing guy like you in my life. I love you! Happy 2 years, here is to many more amazing years to come.